Mark assists clients in corporate and debt reorganizations and distressed mergers and acquisitions. In particular, Mark guides clients in Chapter 11 restructuring proceedings, whether the party is a lender, vendor, debtor or strategic buyer. Although Mark is best known for his work on behalf of asset-based secured lenders and trade vendors, he most recently represented a system of rural critical-access hospitals in a Chapter 11 restructuring proceeding. Mark began his career as the law clerk for federal bankruptcy Judge Frank W. Koger during the Food Barn Stores Inc. bankruptcy in Kansas City, Mo. 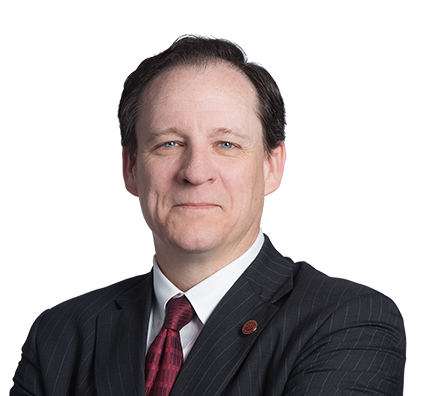 Building on that early grocery experience, Mark has focused a substantial portion of his practice during the past decade on food industry and agricultural Chapter 11 bankruptcy proceedings. This has involved matters from “field to table” and everywhere along the supply chain, including issues under the Perishable Agricultural Commodities Act (PACA) and the Packers and Stockyards Act (PASA). Assisted the successful buyer in acquiring seven operating grocery stores in the Foods, Inc. bankruptcy in Des Moines, Iowa. Assisted the successful buyer group in the acquisition of 43 operating grocery stores in the Belle Foods, LLC bankruptcy in Alabama. Reorganized HMC/CAH Consolidated and 12 operating affiliates in Chapter 11 bankruptcy and completed the restructure in 15 months. These rural critical-access hospitals emerged in a true reorganization without a sale or shutdown of hospitals. Advised Patient First Healthcare and affiliates in Chapter 11 bankruptcy. The group of companies included a surgical specialty hospital and physician practices and emerged in a true reorganization. Represented Associated Wholesale Grocers in the nearly $300 million acquisition of the six operating divisions from the Fleming Cos. bankruptcy. In addition to the food industry, Mark’s restructuring experience includes healthcare (surgical specialty hospitals, ambulatory surgery centers, physician practices, critical-access hospitals and medical equipment leasing); transportation (trucking and capital equipment and terminal rental adjustment clause leases, also known as TRAC); and energy (oil, natural gas, coal, ethanol and wind; exploration, production and pipelines). Represented HMC/CAH Consolidated Inc. and its 12 operating affiliates as debtors-in-possession in their Chapter 11 bankruptcy in Kansas City, MO. Assisted system of 12 rural hospitals with annual revenues of approximately $100 million reorganize and emerge from Chapter 11 within 15 months of filing as a true reorganization without shutting down or selling a single hospital. Served as co-counsel for Patient First Healthcare Inc. and its affiliates as debtors-in-possession in their Chapter 11 bankruptcy in Kansas City, Kan. Advised surgical specialty hospital and affiliated physician practices in reorganization plan to emerge as a true reorganization without a shutdown or sale of their businesses. Represented Associated Wholesale Grocers Inc. (AWG) in the nearly $300 million acquisition of six operating divisions from the Fleming Cos. Inc. bankruptcy in Wilmington, Del. Counseled National Beef Packing Co. LLC as a trade vendor in obtaining payment in full on its claims through a reclamation process in the Fleming bankruptcy. Represented National Beef as a trade vendor in the bankruptcy of Empire Beef Co. Inc. in Rochester, N.Y., and obtained recognition of the first Bankruptcy Code Section 503(b)(9) creditors’ committee in the nation. Also obtained dismissal of the bankruptcy case, thereby avoiding litigation against all vendors over alleged preferential transfers, including National Beef, which was alleged to have received in excess of $40 million in preferential transfers. Represented AWG as a strategic buyer in the Affiliated Foods Southwest Inc. bankruptcy in Little Rock, Ark. Obtained a Section 363 sale order within five business days of the bankruptcy filing. Represented AWG as a secured lender and vendor in the Homeland Stores Inc. bankruptcy in Oklahoma City, Okla., where AWG acquired ownership of approximately 44 stores through a sale approved in the Chapter 11 plan. Assisted AWG in the spinoff of its retail operations of approximately 80 stores to an employee stock ownership plan (ESOP). Represented the American Baker’s Association retirement plan as a creditor in the Interstate Bakeries Inc. bankruptcy proceedings in Kansas City, Mo., where the plan received a substantial distribution as an administrative claim and a favorable ruling with respect to single employer versus multiemployer liability against the Pension Benefit Guaranty Corp. Represented Wells Fargo Bank N.A. as a defrauded lender in the George Young bankruptcy proceedings in Kansas City, Mo. Young perpetrated what was at the time the single largest cattle fraud scheme ever in the United States. Led negotiations for the defrauded investor group and its lenders and was instrumental in forging a global settlement with more than 50 stakeholders, resulting in a distribution and recovery for all creditors.